Looking for something new to do at the beach? Why not give surfing a try. 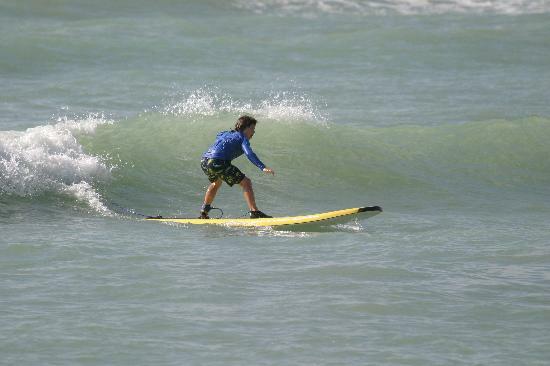 Many of us think of huge waves and large swells, but due to the wide continental shelf and occasional sandbars, the Island produces normal beach breaks and is a safe spot for beginners to learn how to surf. Surfing (as well as boogie boarding) is permitted on all public beaches except in areas designated for swimmers. The best time of day to catch a wave is during mid- to high-tide. The best time of year to surf the Hilton Head area is from August to December, but beware of hurricanes and storms that are close to shore because the surf gets too high and the conditions too windy. You’ll find very strong currents during the spring tides. Watch out for stingrays during the spring months and jellyfish during the summer. Lifeguards will put out warning flags if these conditions exist. If you want to check out the current surf conditions, visit this website which will tell you how high the waves and swells are for a set day. There are a number of companies on the island which offer surf lessons and equipment, many of which are part of the Beach Properties Preferred Guest Discount card. Book Your Hilton Head Vacation Rental Today! Sign up to receive our monthly newsletters and seasonal discounts on your next Hilton Head Island vacation rental.